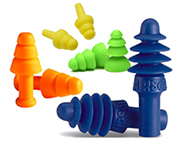 Welcome to our extensive selection of industrial reusable ear plugs. We offer the lowest prices and the widest selection of ear plugs available anywhere, including many of the most popular industrial and consumer ear plugs, both reusable and disposable, all from the best brands. Tip: Industrial reusable earplugs come with a wide variety of options: corded or uncorded, some are available with non-static cords, some come with carry cases. (NRR 24) Tasco RD-1 pre-molded reusable ear plugs stand out from other no-roll reusable ear plugs because they have an unusually long central stem. This extra long tab allows for simple push-in insertion and quick and easy removal every time. (NRR 26) Quiet requires no rolling - its built-in flexible stem adds in ease of insertion and immediate comfort. Excellent choice for motorcycle wear and most general noise environments up to 105 dB. (NRR 25) TriSonic Ear Plugs are easy to insert with their firm insertion stem, and their triple-flange design makes a good seal against noise. More hygienic than traditional foam ear plugs, TriSonic is also reusable. Translucent orange color for easy inspection. One corded pair. (NRR 27) Radians Resistors™ 27 Reusable Ear Plugs provide three flanges for a safe, accurate and comfortable seal. The Excellent NRR and the terrific price point make these durable earplugs a top choice. Each pair in a poly bag. (NRR 24) Tasco RD-1 pre-molded reusable ear plugs stand out from other no-roll reusable ear plugs because they have an unusually long central stem. This extra long tab allows for simple push-in insertion and quick and easy removal every time. One corded pair. (NRR 28) Radians Snug Plug Reusable Ear Plugs are one of the highest rated reusable ear plugs available, and one of the most cost-effective too. Each pair in poly bag. (NRR 27) Elvex Quattro™ industrial reusable ear plugs feature a stiff insertion stem and a tapered four-flange design to fit most users. (NRR 26) Howard Leight by Honeywell Quiet Reusable Ear Plugs uncorded, each pair in a sturdy reusable carry case. (NRR 26) Howard Leight by Honeywell Quiet Ear Plugs, Three sizes w/Cord. No Case. (NRR 27) Radians Resistors™ 27 Reusable Ear Plugs provide three flanges for a safe, accurate and comfortable seal. The Excellent NRR and the terrific price point make these durable earplugs a top choice. Each corded pair in a poly bag. (NRR 28) Radians Snug Plug Reusable Ear Plugs are one of the highest rated reusable ear plugs available, and one of the most cost-effective too. Each pair in carry case. (NRR 27) Hearos F4 Series reusable ear plugs feature a unique 2-dome 2-disk-flange tip that helps achieve the proper fit, for the maximum possible noise blocking and the most all-day comfort. Bright blue color. Lasts through many uses with proper care. Ideal for industrial settings. (NRR 28) Radians Snug Plug Reusable Ear Plugs are one of the highest rated reusable ear plugs available, and one of the most cost-effective too. Each Pair Corded in poly bag. (NRR 27) Hearos F4 Series reusable ear plugs feature a unique 2-dome 2-disk-flange tip that helps achieve the proper fit, for the maximum possible noise blocking and the most all-day comfort. Bright blue color. Corded for extra convenience. Ideal for industrial settings. (NRR 27) Moldex JETZ® are designed for simple one-step push-in insertion, making it super quick and easy to get an effective seal against noise. One pair. (NRR 28) Radians Snug Plug Reusable Ear Plugs are one of the highest rated reusable ear plugs available, and one of the most cost-effective too. One corded pair in carry case. (NRR 27) Durable, washable, reusable silicone earplugs. One of the most popular earplugs sold today. Features a 4-flange design for an excellent seal and fit. Uncorded in Poly Bag. (NRR 25) Moldex Comets® Reusable ear plugs are the first reusable earplug to feature an innovative "finger fit" that allows the user to easily guide the earplug directly into their ear canal, providing a custom fit and no stem to interfere with wearing a helmet. (NRR 25) SmartFit Earplugs With Removable Cord and sturdy hearpack carry case are the only reusable ear plugs with Conforming Material Technology,™ which uses body heat to adapt to the shape of the ear canal for a comfortable, personalized fit. (NRR 26) Howard Leight by Honeywell Quiet Reusable Foam Ear Plugs Corded with sturdy carry case. (NRR 25) Howard Leight by Honeywell Smart-Fit Reusable Non-Static Corded ear plugs were created specifically for the process industries where static electricity discharges can be devastating. One pair with fixed white cotton cord in paper bag. (NRR 27) Moldex JETZ® corded ear plugs are designed for simple one-step push-in insertion, making it super quick and easy to get an effective seal against noise. One pair. (NRR 27) Durable, washable, reusable silicone earplugs. One of the most popular earplugs sold today. Features a 4-flange design for an excellent seal and fit. White cotton-corded in Poly Bag. (NRR 25) Moldex Comets® Reusable ear plugs, corded, are the first corded reusable earplug to feature an innovative "finger fit" that allows the user to easily guide the earplug directly into their ear canal, providing a custom fit and no stem to interfere with wearing a helmet. (NRR 27) Durable, washable, reusable silicone earplugs. One of the most popular earplugs sold today. Features a 4-flange design for an excellent seal and fit. Uncorded with durable carry case. (NRR 27) Moldex Rockets Reusable ear plugs are a great all-around reusable ear plug, they are PVC-Free, in purple and green or special-ops camo, each with a nice carry case. (NRR 27) Howard Leight by Honeywell Fusion Reusable Ear Plugs feature a removable cord, a multi-flange design, two sizes to fit nearly everyone and each pair comes in a sturdy carry case. (NRR 27) Durable, washable, reusable silicone earplugs. One of the most popular earplugs sold today. Features a 4-flange design for an excellent seal and fit. White cotton-corded in durable carry case. (NRR 27) Durable, washable, reusable silicone earplugs. One of the most popular earplugs sold today. Features a 4-flange design for an excellent seal and fit. Red Poly-Corded in Durable Carry Case. (NRR 27) Durable, washable, reusable silicone earplugs. One of the most popular earplugs sold today. Features a 4-flange design for an excellent seal and fit. Red poly-corded in poly bag. (NRR 27) Moldex Rockets Reusable ear plugs, corded, are a great all-around reusable ear plug, they are PVC-Free, in purple and green or special-ops camo, each with cord and a nice carry case. (NRR 24/4) At the base of each Flip earplug's stem, there is an cap that can easily be switched from closed (NRR 24) to open (NRR 4) or vice versa. The result is that you don't need to remove Flip ear plugs in order to have a conversation or listen to safe sounds around you.